Sometimes people do not produce enough tears or the right quality of tears to keep their eyes healthy and comfortable. This condition is known as dry eye. If your eyes feel tired, sore, gritty or sandy, you may have dry eyes. The eyes may feel scratchy or gritty as though there is something in them. They also can be itchy and red and may feel as if they are burning or appear crusty. Each layer has its own purpose. The oily layer produced by the meibomian glands forms the outermost surface of the tear film. 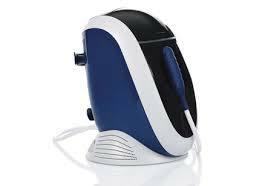 Its main purpose is to smooth the tear surface and reduce evaporation of tears. The middle watery layer makes up most of what we ordinarily think of as tears. This layer produced by the lacrimal glands in the eyelids, cleanses the eye and washes away foreign particles or irritants. The inner layer consists of mucus produced by the conjunctiva. Mucus allows the watery layer to spread evenly over the surface of the eye and helps the eye remain moist. Without mucus tears would not stick to the eye. Normally the eye constantly bathes itself in tears. By producing tears at a slow and steady rate the eye stays moist and comfortable. The eye uses two different methods to produce tears. It can make tears at a slow, steady rate to maintain normal eye lubrication. It can also produce a lot of tears in response to eye irritation or emotion. When a foreign body or dryness irritates the eye, when a person cries or when excessive tearing occurs. 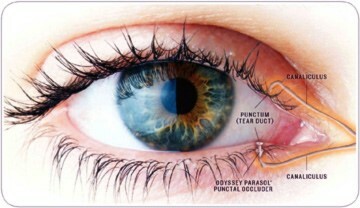 It is paradoxical that a dry eye would cause excess tearing, but think of it as the eyes response to discomfort. If the tears responsible for maintaining lubrication do not keep the eye wet enough, the eye becomes irritated. Eye irritation prompts the gland that makes tears (called the lacrimal gland) to release a large volume of tears, overwhelming the tear drainage system. These excess tears then overflow from your eye. When you blink a film of tears spreads over the eye making the surface of the eye smooth and clear. Without this tear film good vision would not be possible. Hormonal changes are a main cause of dry eye syndrome, causing changes in tear production. The hormonal changes associated with menopause are one of the main reasons why women are most often affected by dry eye. Conditions that affect the lacrimal gland or its ducts (including autoimmune diseases like lupus and rheumatoid arthritis) lead to decreased tear secretion and dry eye. Tear secretion also may be reduced by certain conditions that decrease corneal sensation. Diseases such as diabetes and herpes zoster are associated with decreased corneal sensation. So is long term contact lens wear and surgery that involves making incisions in or removing tissue from the cornea (such as LASIK). A wide variety of common medications both prescription and over the counter can cause dry eye by reducing tear secretion. Another cause for dry eye is exposure to a dry, windy climate, as well as smoke and air conditioning, which can speed up tear evaporation. Avoiding these irritants can offer dry eye relief. Computer use can also contribute to dry eyes as you blink less thus affecting tear quality and production. You should take regular breaks whilst using the computer. Treatment options will vary depending on the type of dry eyes that you have. If there is a shortage of water production, it is necessary to increase the supply of water in the tear layer. If there is sufficient water but excessive evaporation of the tears, then the tears will also be lacking due to exposure to the outside world. It is necessary to improve the oily layer of the tears to reduce evaporation. Eye drops called artificial tears are similar to your own tears. They lubricate the eyes and help maintain moisture. Artificial tears are available without a prescription. There are many brands on the market, so you may want to try several to find the one you like best. Preservative free eye drops are available for people who are sensitive to the preservatives in artificial tears. If you need to use artificial tears more than every two hours, preservative free brands may be better for you. You can use the artificial tears as often as necessary, once or twice a day or as often as several times an hour. It is generally advised to use drops 4 times a day minimum. Using a thicker lubricating gel at night helps to build up the lipid layer on top of the water layer thus giving added ocular protection at night. Conserving your eyes own tears is another approach to keeping the eyes moist. Tears drain out of the eye through a small channel into the nose (which is why your nose runs when you cry). Mr. Golchin may close these channels either temporarily or permanently. This method conserves your own tears and makes artificial tears last longer. A temporary method of closing the channels may involve the use of punctal plugs. The plugs are inserted into the punctum (tear duct) and works by blocking your eyes drainage system. Using a commercially available warm compress or a hot facecloth, place this over your eyes for at least 10 minute. The heat tends to make the meibum secretions softer and dilate the glands slightly thereby facilitating the expression of the oily meibum. Developing a regular routine of eye hygiene is essential in the treatment of dry eyes especially those linked to meibomian gland dysfunction and blepharitis. It is important that you clean your eyelids every day, whether or not you are experiencing any symptoms. You should consider it part of your daily routine, much like brushing your teeth! Effective eye hygiene will reduce both the severity and frequency of symptoms. In IPL treatment, a hand-held device flashes bright light onto the skin. The light is filtered to allow only wavelengths that can be absorbed by dilated blood vessels in the eyelids. The effect of this treatment may be the resolution of these dilated blood vessels and associated inflammation. Many patients experience relief from their dry eye symptoms and become less dependent on artificial tears and other eye drops to control dry eye symptoms after IPL treatment. For this reason, IPL treatment may be well suited to dry eye patients who are troubled by the inconvenience of frequent eye drop use. Studies have found that supplements containing omega-3 fatty acids can decreased dry eye symptoms. Good sources of Omega-3 include cold water fish such as salmon, sardines, herring and cod. Omega-3 is also found in flaxseed, walnuts and dark leafy vegetables and can reduce dry eyes by 30-60%. Omega Eye is a scientifically formulated food supplement recommended for all dry eye sufferers. Drinking more water can help too. Mild dehydration can often make dry eye problems worse. This is especially true during hot, dry and windy weather. Simply drinking more water can sometimes reduce dry eye symptoms. It may seem strange but a healthy diet can help to prevent dry eyes. A wide variety of medications can cause dry eyes. By maintaining a healthy lifestyle – increasing exercise, reducing alcohol and salt, healthier food choices this can reduce the need for a lot of these medications in the first place. Tobacco smoke is a known ocular irritant and can contribute to dry eye syndrome. Blink more frequently –When using a computer, smartphone or other digital device, we tend to blink less frequently than normal which can cause or worsen dry eye symptoms. Make a conscious effort to be aware of this, and blink more often when using these devices. Take frequent breaks during computer use – A good rule of thumb here is to look away from your screen at least every 20 minutes and look at something 20 feet from your eyes for at least 20 seconds. This can often relieve both dry eyes and computer eye strain. Wear quality sunglasses – When outdoors during the day always wear sunglasses that block 100% of the suns UV rays. A good pair of wraparound sunglasses will protect your eyes from wind, dust and other irritants that can cause or worsen dry eye symptoms. Discontinue or reduce contact lens wear – If you wear contact lenses, it can be difficult to tell if an underlying dry eye condition is causing contact lens discomfort or if your contact lenses are causing dry eye symptoms. If you wear contacts, it’s often best to discontinue wearing them while your dry eye treatment is in progress. At 65, I now have better vision than when I was 17. I was required to wear glasses for driving (driver eye test). I now have 20/20 vision at a time in my life when I would be expected to be getting reduced vision. This is all down to Mr. Behrooz Golchin's expert skill and care. I have had both my cataracts removed and a retinal tear repaired using laser surgery. Fantastic! Now, if I could find a Mr. Behrooz Golchin who specialised in weight management, I would be home and dry.. My sincere thank to Mr. Behrooz Golcin and his team. Keep up the good work!